Kayakers off Northern Vancouver Island in British Columbia sit patiently for a pod of Orca to pass by. Off of Northern Vancouver Island in British Columbia, Canada you will find kayakers that love to venture out for week long trips or day trips hoping to get the chance to see an Orca or two pass by. These kayakers stop and wait for a pod of Orca that are heading in their direction hoping to capture a close encounter with an Orca. A killer whale is a large mammal when seen from a bigger water vessel but in a kayak their size and majestic beauty is incredible. Some kayakers are lucky enough to have an Orca surface beside their kayak and enjoy a once in a lifetime experience. There are a variety of kayaking tours offered around Northern Vancouver Island in British Columbia, Canada for either novice, intermediate or advanced kayakers. 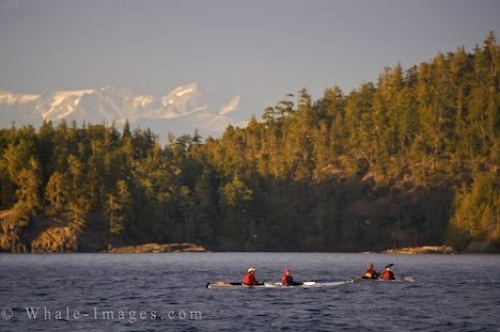 Johnstone Strait is an excellent location to test out your kayaking skills and explore the beautiful scenery and wildlife that resides off Northern Vancouver Island. Having an experienced guide along on your journey is advisable as the waters off Northern Vancouver Island can be challenging in some areas and wind or storms can pick up within minutes. Professional kayakers are always an advantage point to your trip.